All rentals are based on a calendar day (not a 24 hour period). The Superior National Forest along the north shore has many great inland lakes to explore offering a safe environment for any paddler from beginner to experienced. This is a fun and safe way to enjoy kayaking on your own. We can give you some basic instruction before you head out on your adventure. 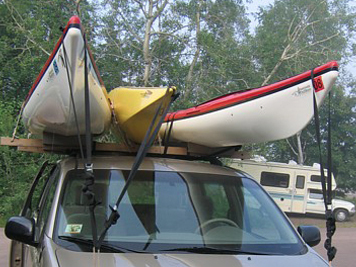 We provide what is necessary to load the kayaks on your vehicle. 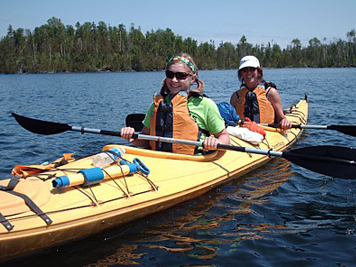 Our first priority when considering the rental of our kayaks is your safety. Kayak touring is quite safe, but the waters of Lake Superior can without warning become dangerous or even fatal. Knowledge, judgment and the ability to perform rescues should be fundamental when contemplating going out paddling in cold-water environments such as Lake Superior. Statements like…”Oh, I will just stay near shore” or “I’m not worried about tipping over” …indicate a lack of knowledge and experience we require for rentals on Lake Superior. One Exception: We will rent to someone who is going to be accompanied by an experienced paddler who is knowledgeable in performing kayak rescues and is willing to take responsibility for the inexperienced person or persons in the group. 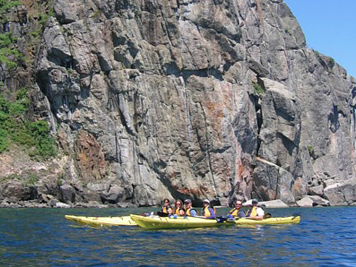 If you do not have kayak rescue certification to safely explore Lake Superior on your own, check out our Guided Tours. Rental Includes: paddle, life jacket, spray skirt, wetsuit, paddle float, pump, and car top carrier.